There are three types of bicycle innertube valve: Schrader, Presta, and Woods. 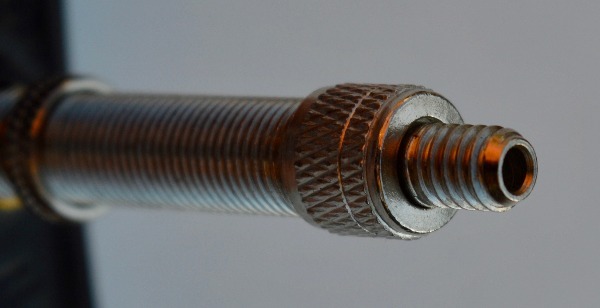 Tubeless valves come in two types: Schrader and Presta. Found on all motor vehicles as well as bikes with wider tyres, the Schrader valve is user-friendly. The usual procedure is to push the pump head on the valve, lock it in place with a lever (which depresses the central stalk), then pump away. When you remove the pump head, the central stalk automatically pops back up, closing the valve. All Schrader valves have removable cores. The disadvantage of the Schrader valve is that it requires a larger diameter hole in the rim: 8mm versus 6mm for a Presta. That makes it unsuitable for narrow rims, as used on most road bikes, because there’s not enough metal left around the hole for adequate rim strength. The more complicated one. To inflate, first unscrew the knurled nut on the central stalk so it sits at its top. Then depress the stalk slightly – you’ll hear a hiss of air – attach your pump, and start pumping. When finished, remove the pump and screw the knurled top-nut down again to close the valve. Presta valves are easier to use if your pump has a hose and the pump head locks in place. Take care with push-fit hand pumps: it’s easy to bend the central stalk, making it difficult or impossible to close the valve. If it doesn’t have a removable core – some Presta valves do, some don’t – you’ll need a new tube. Rarer than the other two but still popular on Dutch bikes, it has a wide valve stem like a Schrader requires a Presta pump to inflate. Just push it on; there’s no knurled top-nut to undo. That wide knurled ring is for holding the easily removable valve core in place. Some pumps are designed for use on both Schrader and Presta/Woods valves, being switchable from one type to the other – sometimes requiring partial reassembly. Others do only one type, usually Presta/Woods. Separate valve adapters are available but are easily lost. Better to have a matching pump. A new innertube requires the right size valve for your rim. A Schrader or Woods valve will not fit the hole in a Presta rim. 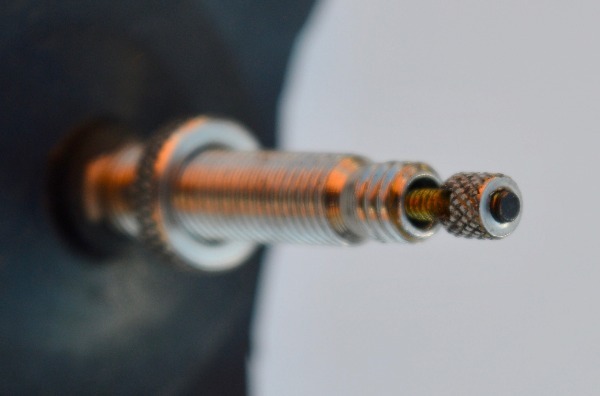 A Presta valve will go through the larger Schrader/Woods hole but, because it can move back and forth, could tear at the base of the valve stem. To fit a Presta tube in a Schrader rim properly, first push in a rim valve-hole grommet to adjust the hole diameter; they cost pennies. If your bike has deep-section wheels, make sure the replacement innertube has a long valve stem, otherwise there won’t be enough protruding to attach a pump. Valve extenders, which screw on semi-permanently, are available. Rain showers are inevitable. Here’s a selection of tips to keep you safe and dry throughout your commute by bike.